An evening of musical nostalgia and poignant readings is being planned in celebration of the contribution made by our Armed Forces past, present and future. The popular annual Veterans’ Evening celebration hosted by North Kesteven District Council will this year reflect on the centenary of the First World War and 70th anniversary of the end of the Second World War, as well as recent service engagement. The main focus will be the presentation of Veteran’s Badges to people who have served in the Forces but not previously received the badge, which is now issued as a matter of course on departure from service. Residents of North Kesteven are invited to register to receive a badge in recognition of their dedicated service and the wider public is invited to attend in celebration and commemoration. The event will be held in NKDC’s Civic Suite in Sleaford on Friday, June 26, the eve of national Armed Forces Day, with talks, entertainment, and a buffet supper as well as the badge presentation. Wider Armed Forces Week celebrations include a flag raising ceremony at NKDC on Monday, June 22, at 10am for 10.30am, to which the public, schools and Armed Forces personnel are invited. There will also be a children’s poster design competition, shop window decorating competition in Sleaford, encouragement for all traders across the district to dress their windows too and promotion of any discounts offered by businesses to members of the Armed Forces and Veterans. The £7 ticket price includes performances from the Billinghay Ruffs and Tennyson Collective which collaborated at last year’s Lights Out event, the Spitfire Choir of serving female personnel at RAF Cranwell and readings from wartime correspondence, poetry and diary recollections. Guest speakers will detail aspects of service across the Forces including Commandant of RAF College Cranwell, Air Commodore Chris Luck. To buy tickets and to request a badge – for yourself or someone you know – contact Debbie Scott in the Community Initiatives Team on 01529 414155, email Debbie_scott@n-kesteven.gov.uk or call in to the NKDC offices at Kesteven Street, Sleaford. Deadline for badges is June 8. Limited information is required, including Service Number, date of birth and brief service history. In more than a decade, NKDC has presented around 325 badges to veterans who served over the years. Only those who register and attend the presentation will be eligible to formally receive a badge in this way, although veterans not wanting to attend the presentation may apply direct to the Veterans Agency. Eligibility covers men and women who served in HM Armed Forces, Police Forces under UK Command, Cyprus Regiment and the Home Guard. Businesses are asked to show their support. Decorate windows in a theme befitting Armed Forces Week (June 22 to 27). 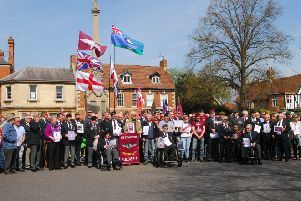 In Sleaford there is a competition with the prize being tickets to the Veterans’ Evening. Also tell Debbie Scott at NKDC, in good time, about any discounts you offer Armed Forces personnel or veterans so that these can be promoted. Contact RAF College Cranwell if you would like your business to be associated with the Station Families’ Day on Thursday, July 23, 12pm to 6pm. This is the first in many years with around 4,000 people anticipated. The station is appealing for business sponsorship for attractions – contact Sqn Ldr Anne MacKean, Adastral Hall, PO Box 1000, RAF Cranwell or on 01400 261201.